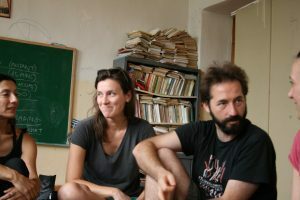 After reading much of the Unmonastery website and their work related to their activities in Athens and Matera, I was very excited by the invitation to join them in an Unconvention in Kokkinopilos. Remote it was. 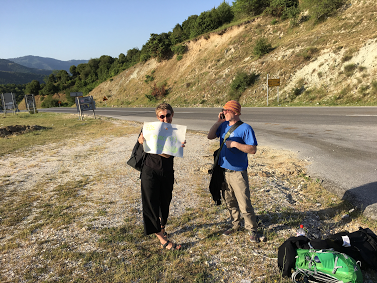 The journey from Thessaloniki to Katerini was negotiated well, though just as our small group complemented ourselves on good progress, were told that the last bus toward our destination had departed. Welcome to rural Greece! Beer eased the drama and inspired us to hitch the rest of the way. With network /data connection, battery power fading fast, signs were made to hitch along the only road to the mountains. At last we were picked up, the kind fellow had a usb lead to recharge phones – all working out. There followed an hour of going steadily up and around tight bends, visiting a mountainside water fountain and passing many beehives. We piled out at a crossroads which seemed to be in the middle of nowhere, but not far from a very very big bull! Our destination was the Unmonastic space, previously a primary school, now a stopover for fell runners the unplugged. No kitchen, so great meals and tsipouro were provided at a nearby friendly taverna. Sarantaporo.gr, is the mountain area community network built in 2014. 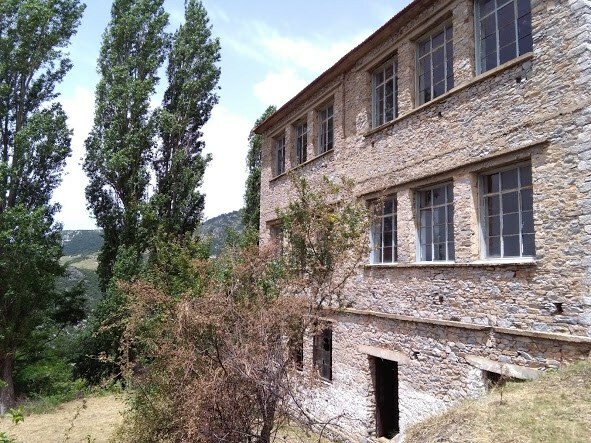 Fourteen villages are now linked together and share internet connection currently provided by Larissa University, some 70km away. After the 5ghz bridge, it is then made public using 2.4 ghz open mesh access points. A wide range of locally hosted services and solutions to support farming, mountain living and tourism throughout the area are possible as a result, but it’s still early days! The school we stayed in. The main signal from Larissa is received at a large parabolic dish on a garage roof in Sarantaporo and then relayed from village to village. Sparse use of wifi in the area means very good signal to noise which is great for link quality; in other words, even though we were downhill and tucked away from neighbourhood access point, we could get a usable connection for email and a bit of web access. As part of the introduction to the Unmonastic style of daily routine, we had a timetable. Each early morning we awoke to tapping ‘bells’, got ready and walked up to a stony football ground and did some tai chi, which was great. 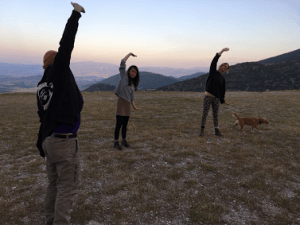 Finally, a group of people wanting to exercise and practice – on the side of a mountain! Sorry, I digress. The UnMon rituals were definitely a way to get everyone up early (with such a great view it was worth it), and days were filled with looking around the village, discussing the potential for using a larger unused school as a potential Unmonastic space. This offered potential as refuge, for working people visiting the area and beyond to take in the views, walk in the lush forests, see the fireflies at night. In exchange, help rebuild the school buildings to be functional again – promote cultural and language exchange, digital literacy and coding. Perhaps, English sessions would be popular, for supporting tourism or would some turf on their stony football field be a better option? Tai chi on a mountain, anyone? I also started conversations about MAZI options, trying out the school network, a Raspberry pi with a Lime survey system, Etherpad and Owncloud; with varying results. Etherpad is not very useful at presenting previous notes, the polling system needed more questions to be useful as an evaluation tool, Owncloud was quite useful as a repository of images and the recording of the singing from the local Orthodox church. On our visits we were shown the local museum, the little park/viewing platform, and visited other tavernas. The village overall was very quiet, even with the numerous tavernas. Mostly older folk in residence, with only a few children to be seen. We collectively found out that most of the younger generations have gone to the towns and cities, leaving a situation I would say is themed across many rural areas, no matter what country. Interestingly, the presence of internet access hadn’t yet changed this dynamic, as the elderly residents saw little use or need for it and like so many of their generations, didn’t have the skills to utilize it either. Famously it’s the grandchildren who have made the best of these improvements, forging links with aging relatives in summer months and retaining the link on return to the cities. Giorgos was a local climber living nearby and gave a us much information about the area – at this point I realised that a MAZI initiative could be to establish a repository of local oral history to engage their offspring and visitors in village heritage; the locals were Greek speaking 2nd or 3rd generation Vlachs from Romania. We were also told by the elder running the museum that the British and Germans fought in the area too. It seems that some locals had started a web site, and needed help with putting it together. This is where the digitally skilled members of the Unmonastery could get involved. Panayotis Antoniadis had suggesting harvesting the bountiful St.John’s Wort growing in the area and infusing into olive oil for market. The flower has a reputation for helping with depression and soothing anxiety. An irony of this proposal, is that some of the remaining bored youth take to drink and drugs, causing social problems, according to Giorgios. Perhaps processing and sale could contribute to local economy and improve employment prospects or improve the mood for some. Only there a week and each day was filled, it felt that much more time had passed by. Accumulated sleep deprivation from early mornings and late nights was setting in, so my silences grew longer. Doubt set in about being about to communicate coherently, so became quiet for a change. Perhaps the red oil from St.John may have helped. Having just about managed to learn Greek for yes and no plus a single swear word, my community engagement was limited. Should I decide to return for the longer haul? The harsh winters there would be a challenge, though learning Greek would be tougher. Definitely worth a second visit anyway. This entry was posted in unMonastery: nomadic. Bookmark the permalink.